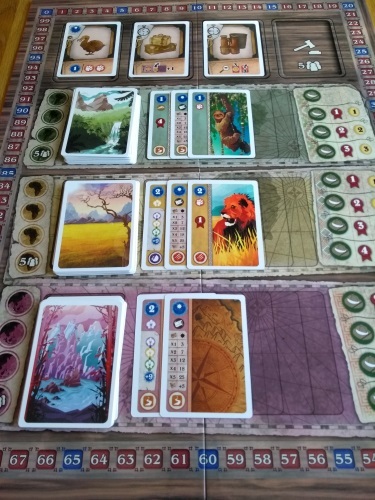 Exploriana is a push-your-luck and set collection gateway level game for two to five players (I’d say three to five – see below) that usually plays out in around an hour. The box states 10+ for the age range and that feels about right. While the game has very familiar mechanisms for gamers, there is quite a lot going on throughout. 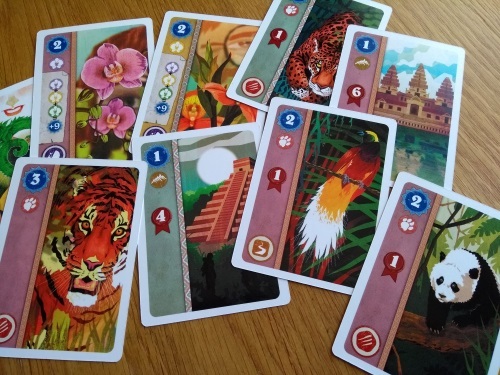 The game is not yet published, but can be backed on Kickstarter now from £30 (which I think is great value). If you want to be kept up to date on its progress, and the Kickstarter launch, you can sign up for updates on the official Exploriana website. While not a particularly thematic game, the central tenets of exploration and discovery, risk and reward, do shine though in the gameplay. As intrepid 19th Century explorers the players will be heading off to South America, Africa and the Far East to unearth ancient civilisations and exotic animals (gather cards for victory points): anyone familiar with games such as Archaeology and Thebes will find themselves in familiar territory. The version I received was pre-production, as it is due on Kickstarter soon. But I hope they keep the gorgeous card art, which has a unique and compelling style. I also presume the component list won’t change much: central board (plus five player sheets), around 80 cards, 40 or so counters and some currency (I had cardboard coins). I have no idea about pricing options, but this is a medium sized game (the prototype was in a Carcassonne-sized box, which I see no reason to change). Exploriana is a super simple game to teach gamers, as everything you do feels completely familiar. And it works through three very distinct (yet simple) phases, so with less experienced players you can easily walk through one round of these to familiarise everyone, then rewind and start playing properly. 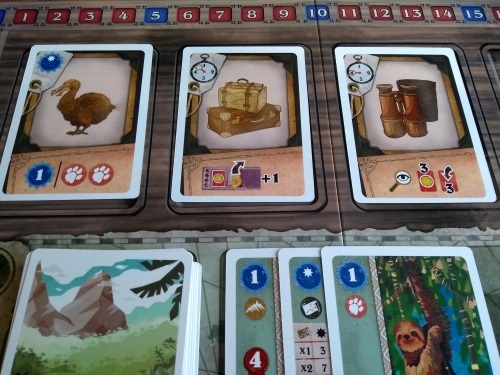 The game is played over several rounds (the amount varies on player count and potentially end-game conditions), each of which plays out in the same way: item auction, worker placement, exploration. The auction lets you gain equipment (for one-shot benefits and to bolster end-game scoring); worker placement sees you choosing which of the three areas you want to explore; then exploration sees you pushing your luck (or not) to collect cards from those areas – either for victory points, money (auction funds) or renown (for turn order and some end game scoring). The auction couldn’t be much simpler, or much quicker. In turn order, players choose one of the available pieces of equipment (2-4 are made available each round) and put it up for auction by making a one-time bid for it. Each other player (in clockwise order) then either drops out or raises the bid until you’ve been around the table – and the winner takes the item. This clearly puts the opening bidder at a disadvantage (unless they have the most money), but of course they can choose an item they don’t want to be in better position later for the ones they do. Unlike a game such as Power Grid, there’s no limit to the number of auctions you can win – so going heavily for cash (over victory points) in early explorations to get lots of items is a legitimate strategy. Each player has two workers (or thematically, explorers). The board has three areas depicting the three continents you can explore. Each area has space for 3-4 explorers (again, dependent on player count) which are placed, one each at a time, in turn order. This is a very quick phase, but not without its interesting decisions. Being first into an area is only going to be good if what you want is already on show, or if the path forward is looking fairly risk free (see below) – while following a player who is taking a different path to victory than you could be equally beneficial. Exploring is done from the top worker on the board to the bottom. There will always be at least two cards in an area when your explorer starts his turn, although there could be up to four. The active explorer has four choices: flip over a new card (if there is less than five on view), hire a helper (once per explorer), use a piece of their equipment, or stop exploring and cash out. If you cash out, you get your choice of one prize (normally one card) from that area – unless you have managed to turn over five cards in the area, which allows you two picks. Double the prize is clearly a strong incentive to keep pushing; but fail and you’ll get nothing. So how do you fail? Each card in the exploration deck has a good chance of having one of three symbols on it, representing a disaster that may befall your intrepid explorers. If the flipped cards in your area ever have either one of each symbol, or three of the same ones, its curtains for you (you do get some coin back for your trouble). The three areas have increasingly higher chances of including those symbols on their cards, but – you guessed it – also have more valuable rewards. The rewards themselves are your bog-standard selection of set collection style scoring systems, while some give immediate boosts to your renown or cash pile. If a deck of cards for an area runs out, the game ends prematurely. Either way, the player with the most victory points will be the winner. The writer: In an age where a ridiculous number of games are released each year, it’s hard to get behind an elegant game which brings nothing new to the table. That said, there’s always a place for games that put existing mechanisms together in a satisfying way – and Exploriana does just that. The auction and worker placement are both satisfyingly interactive without any ‘take that’ or blind luck spoiling them; while the push your luck is just that – but with a bit of mitigation available to smooth the edges. The thinker: There’s little here for the serious strategist, but the game doesn’t pretend otherwise. If a player simply flips cards and gets lucky, taking two prizes per turn but with no investment in mitigation, they’re likely to come out on top. But the game plays quickly and does exactly what it says on the tin, so no complaints from me. You can go for money and try to get items that help mitigate the luck – but frankly I’d rather just play something else. The trasher: I rather enjoyed Exploriana. It’s fun trying to out-think your opponents in the auction, trying to work out what they’re holding their money back for; while good placement of your workers can make a real difference. And even if you think you’re losing, there’s nothing to stop you just going for it! There are different paths to victory to: go for money early to invest in items, stick straight for points, get turn order, or mix it up. All have their merits, making for a wealth of tactical decisions. The dabbler: This game is right in my wheelhouse. The exploring theme works well with the push-your-luck idea, while the auction and card-flipping lend themselves perfectly to a bit of table talk. The different character sheets also add a little theme, while the card art is gorgeous (at least in the version we played). Add in the short-ish play time, simple set up and straightforward rules and you have yourself a winning formula for more casual gamers. And you get loot! Who doesn’t like loot? Weirdly, when I play Archaeology: The Card Game, I don’t feel the weight of our colonial past on my shoulders – but I’d be lying if I said it wasn’t a small but constant niggle here. It wouldn’t stop me playing, but I can see it putting some people off. The fact you’re so clearly taking treasures from places you shouldn’t reminds me of the Bugle Podcast gag: The British Museum is the biggest open crime scene on the planet. As with so many 2-5 player games, that player count stretches reality a little – and this time, as in so many auction games, it’s the two-player version that suffers. It employs a clumsy mechanism in the worker placement phase that does its level best to imitate more player’s playing, but frankly – if you specifically want a two-player game, there are loads of good ones out there. Move along, nothing to see here. Replayability is also a potential concern. I’ve enjoyed my five plays to date and am certainly not bored by any stretch, but I’d have liked a bit of variety squeezed into the box. This is very much a matter of opinion, as there’s a lot to be said for exact information in a bidding/push-your-luck game. But I’d have liked something: more items, perhaps another continent deck, individual player powers – take your pick. I don’t often take games that are offered to me that are ‘coming soon on Kickstarter’, but with a long enough lead time to get a good number of plays in – and on reading the rules – I gave this one a punt. And I’m glad I did. 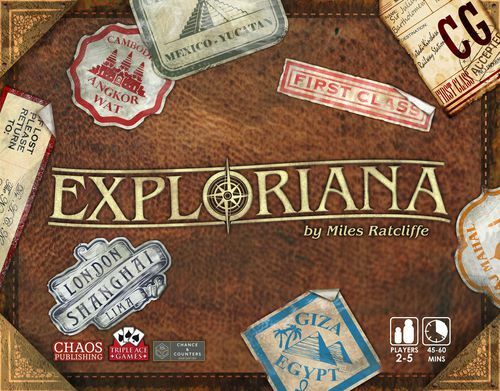 You can’t escape the fact Exploriana is purely a rearranging of the game design toolkit. Basic bidding, basic placement, and the ‘two picks for five cards’ push your luck element from Port Royal – job done. But you’d have to be pretty cynical not to be able to see past that when there’s a really solid execution underneath, as there is here. I’ve had to pass this copy on to another reviewer, but when it (hopefully) comes out the other side of its Kickstarter adventure I plan on adding a copy to my collection of gateway games. * I would like to thank Counters Out for providing a copy of the game for review.